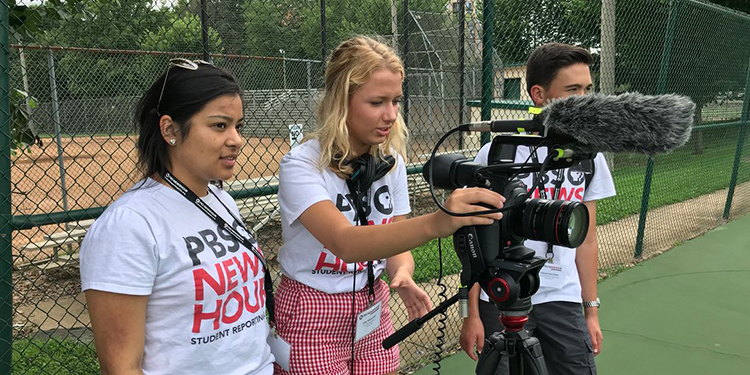 Through the PBS NewsHour Student Reporting Labs (SRL), middle and high school students across the country produce video reports on topics ranging from the changing world of work to new approaches to mental health care and youth-driven civic engagement. And by producing journalism, they learn 21st century skills, including critical thinking, problem-solving, working with others and media literacy. Tsukiyama, a rising ninth grader, was one of 25 students from 17 states nominated by their mentors and selected for the Student Reporting Labs Academy, a one-week summer program held recently in Washington, D.C. Working with teachers and public media mentors, the students got a crash course in journalism and video production while producing news stories in just four days. SRL is funded by the Corporation for Public Broadcasting as part of American Graduate: Getting To Work, a public media initiative aimed at helping young people succeed in school, career and life. SRL also receives support from the National Science Foundation and the Health Science Education Partnership Award. In the nine years since CPB started funding SRL as a pilot project in six schools, it has blossomed into a national program that has trained more than 12,000 students. During the school year, students at more than 130 middle and high schools participate in for-credit classes or after-school activities, with a standards-based curriculum developed with broadcast teachers and professors at Temple University. Through journalism and storytelling, SRL uses research-backed, project-based learning to educate engaged and digitally literate young citizens. When she was part of the Student Reporting Lab at Pflugerville High in Texas, Huff produced a piece on hydroponics that aired on “NewsHour” and landed an internship at KLRU, the PBS station in Austin. She credits SRL for teaching her how to write a script, how to use a camera, how to craft story, and also how to interact with professionals. For more information about the Student Reporting Labs, including student reports, curriculum and locations, go to studentreportinglabs.org. The SRL Academy fellows’ recent reports on the history and arts that make up Washington, D.C. can be viewed online.